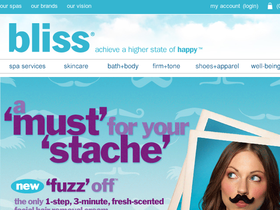 Bliss, online at Blissworld.com, is a popular destination for skincare products. Bliss sells a variety of body scrubs, body lotions, and creams as well as hand and foot products, including softening socks and foot files. Bliss also carries anti-aging products and eye treatments as well as hair shampoos, conditioners, styling tools, and make-up. In addition, Bliss sells bodysuits, undergarments, and body shapers. Customers can also take advantage of online spa booking at a Bliss Spa location. Learn about sale items, clearance prices, and special offers at Bliss. RetailSteal.com has the best Bliss coupons, Bliss discounts, Bliss promo codes, and Bliss coupon codes. Shipping and handling rates at Bliss depend on the pricing of your order and the destination for your shipping request. Orders over $50 are shipped for free but only in the Continental US. International shipping is also available. See website for full details, exclusions may apply. Check out the sale section at BlissWorld.com and enjoy up to 50% off sale skincare, apparel, and accessories. Shop Ted Gibson hair products at Bliss and save 30% with our coupon code. At Bliss, use the coupon code to save 20% on SPF products. Click link for savings. Save 15% off your entire purchase, excluding Skinceuticals, La Mer, SKiII, and, Sisley Brands, using the coupon code at Bliss. Click link to shop online. With the coupon code at Bliss, you can save $25 on your $100 online order. Click link to save. With the coupon code, get four free mini gifts when you place an order of $50 or more at Bliss. Click link to shop. At Bliss, get a free sample of La Mer Moisturizing Gel Cream with any La Mer online order using the coupon code. Click link to place order. Receive a free travel size youth moisturizer with your purchase of a full size moisturizer from Bliss. Enter our coupon code at checkout to enjoy these savings. Enjoy free shipping on pro sizes from Bliss when you use this coupon code. Shop online at BlissWorld.com and enjoy free shipping on your order of $50+.